“Michelangelo of the Menagerie”: Bronze Works by Antoine-Louis Barye features approximately seventy works from the Brooklyn Museum’s holdings of bronzes and watercolors by the French artist Antoine-Louis Barye (1795–1875). 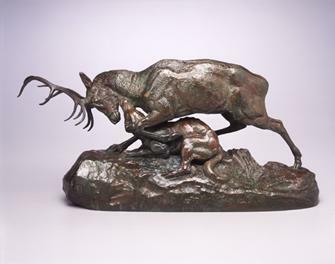 Dubbed the “Michelangelo of the Menagerie” by the contemporaneous art critic Théophile Gautier, Barye devoted his career to animal subjects, from sweet groupings of woodland creatures to violent encounters between predator and prey to mortal combats between the fantastic monsters of ancient myths. He blended the romantic taste for the exotic and the sublime power of nature with the scientific exactitude of a flourishing modern zoology, lending an air of accuracy to every claw, fang, and horn. Trained as a goldsmith, Barye began his career working on animal subjects as minute embellishments for functional, if sumptuous, decorative objects. After military service in the Napoleonic army, he began formal studies in the fine arts. Throughout his life, Barye frequented menageries in and around Paris—most notably, the zoo at the Jardin des Plantes. He also attended dissections of animals at the Museum of Natural History, where he served as the Master of Zoological Drawing from 1854 until his death. At the outset of his career, Barye submitted works to the state-sponsored annual Salon and won acclaim in the early 1830s for plaster models of his predatory scenes, including Tiger Devouring a Gavial (1831) and Lion Crushing a Serpent (1833)—works included in this exhibition as bronze casts. This success brought princely private commissions from the house of Orléans and prestigious public ones from the state. After his early success, Barye’s critical fortunes were mixed: avant-garde writers praised his sculptures, which challenged the hierarchy of the genre with their monumentality and verve, while traditionalists lamented the lack of overt educational or moral value in his work. Scholars have since suggested that the violence in Barye’s scenes is evocative of the bloody napoleonic wars and the turbulence of the French political scene. After a refusal from the Salon in the late 1830s, Barye concentrated on the fabrication of small bronze works for a broader commercial market. This relatively large-scale serial production of affordable bronzes popularized Barye’s work in both Europe and the United States. The wealthy American investment banker Cyrus J. Lawrence collected the vast majority of the works displayed in this exhibition. At his death, the entirety of Lawrence’s collection of Barye bronzes and watercolors was auctioned in 1910 and acquired as a set by the Brooklyn Museum with funds donated as part of a special subscription. This exhibition is organized by Judith F. Dolkart, Assistant Curator, Department of European Painting and Sculpture.